Fishing provides the main source of livelihood amongst residents. Lekki is now home to some of the fastest developing neighborhoods in sub-Saharan Africa. The land prices in Lagos have skyrocketed following the oil boom. In an attempt to take control of the land occupied by the community, homes were forcibly and unlawfuly destroyed, displacing thousands. Remaining and new buildings sit amongst the rubble of homes razed by 'hoodlums' sent into the community. This church was destroyed, though the altar still remains as a place of worship. 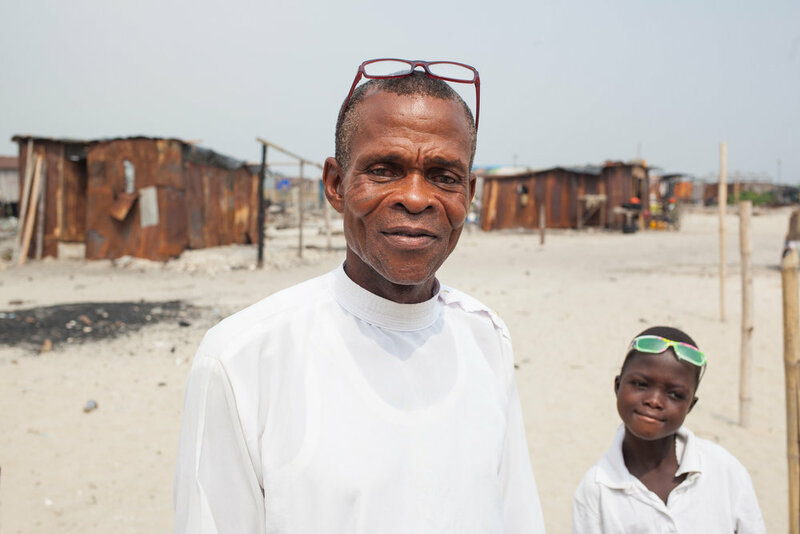 Pascal Torshun, a fisherman and Otodo Gbame elder stands amongst the remnants of a church. Pascal sold drinking water, and is an active community member. Church plays a central role in residents' lives. On a Sunday new makeshift churches form a place of worship amongst the rubble of the destroyed community. Residents continue to worship in community churches on Sundays. Traditional Yoruba religion and symbolism is also intertwined with Christianity. 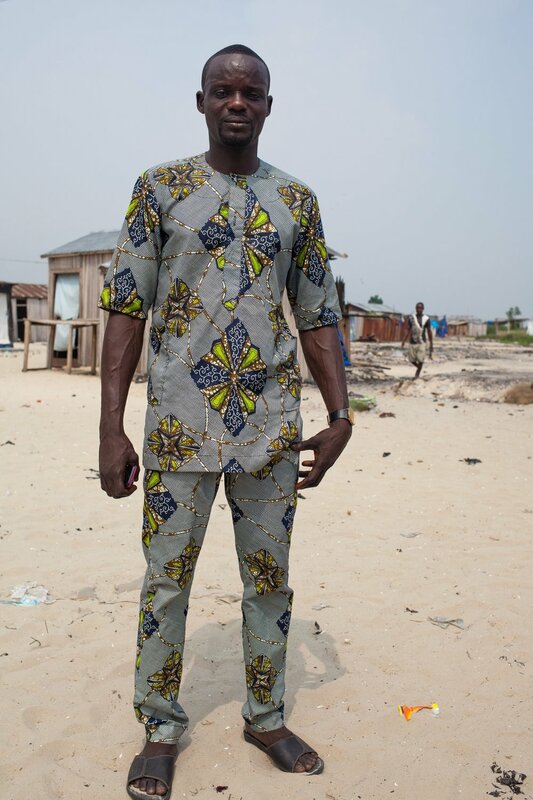 Samuel is a member of the Nigerian Slum / Informal Settlements Federation, a grassroots movement of the urban poor. The Federation works to solve justice and development problems in Nigeria. Paul is a Federation member and one of their many community-based trained para-legals. As a resident of Otodo Gbame, he is helping the struggle for the legal recognition of the right for the community to live on their land. Despite the evictions, residents have quickly set about rebuilding their homes and continuing their struggle against land-grabbing. Less than a month after the evictions, the rebuilding efforts are well underway. Beyond the rubble of a destroyed home, the roof of a new building is being raised. Residents access water from community wells. Sogunro is one of the six "villages" that make up the larger Makoko area. The community is one of many waterfront settlements, and is spread across land and water. Makoko, was formed as a fishing village in the 19th Century. 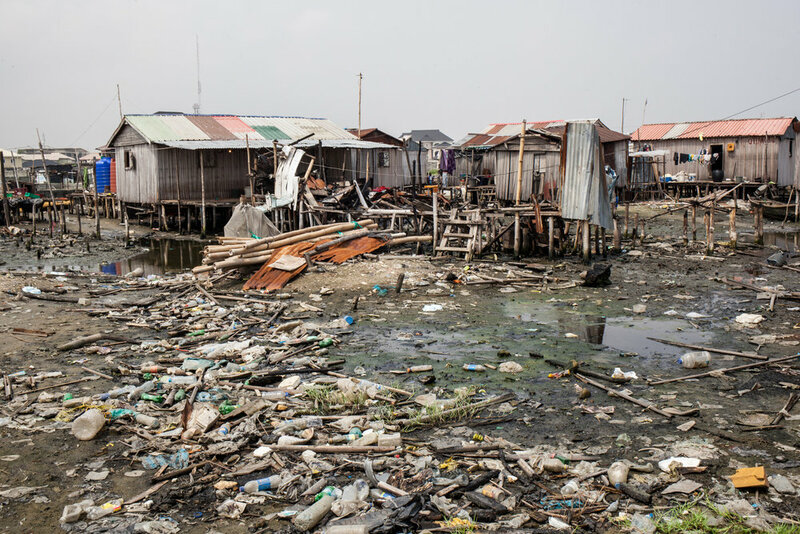 It is one of many waterfront communities in Lagos that live with a constant threat of eviction due to land-grabbing by the Lagos government. Boats offer the most useful form of transport around the maze of waterway 'roads' that connect the community. 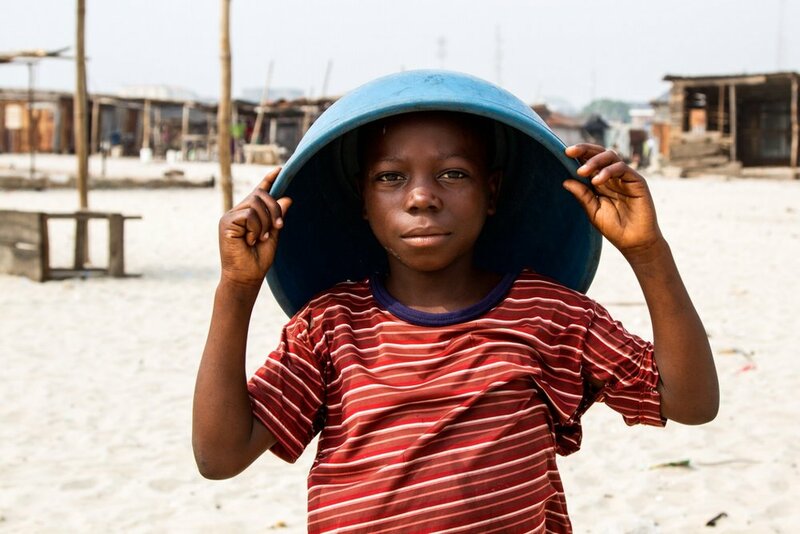 An estimated 2,000 people enter Lagos every day, many ending up in informal settlements like Sogunro. As the population grew, and land ran out, the community began to build into the water. New houses continue to grow. Sogunro, like many of the other waterfront settlements of Lagos, is primarily populated by the Egun ethnic group that originate in the south eastern parts of Nigeria, as well as in neighbouring Benin. Fishing remains one of the main sources of livelihood for members of the community. Fishermen work in the lagoon with the Third Mainland Bridge in the background - the 2nd longest bridge in Africa. Along with fishing, sand dredging and timber are other major sources of livelihood - this child works on fixing his net. Any floating vessel can provide an innovative commute to school. Rubbish litters the waterways where children play and families live. Much of the rubbish is collected an used as an innovative foundation for land reclamation. While some of the community is on such land, the vast majority sits on water. Much of the community reside on stilted houses, whose only access by boat. The busy waterways criss-cross the community. With limited space on land, the community has built onto the water. Following the mass evictions of another waterfront community, Otodo Gbame, the population of Sogunro swelled as many evictees were accommodated. Agbojete Johnson is the Baale, or 'King', of Sogunro. He was instrumental in sending boats to Otodo Gbame to collect evictees and bring them to Sogunro. "It was terrible", he recounts, "the people really suffered. Even as big as this community is, there is no government hospital. They don't care about us." Janet Azindji accommodated twenty people from Otodo Gbame, including eight children. One of the evictees taken in by Janet is Veronica Agbogla. Veronica was blinded by the fires that were lit during the brutal evictions. "I lost my house, all my property, and everything I have laboured for". Veronica is now squatting at Janet's home, but cannot locate the rest of her family. Elenu Dossa, a refugee from Otodo Gbame, says that "now there are too many people living in the rooms where I am squatting. We want the government to help us return home, and to rebuild our houses". Paul Gandotoho (right), a community chief in the community, and Agban Aplanti (centre), a community elder discuss the evictions in Otodo Gbame. As well as being a community chief, Paul Gandotoho is a tailor who took in some of the displaced people from Otodo Gbame. Agban Aplanti, a community elder. Esinsu Francis was evicted after the demolitions in Otodo Gbame. 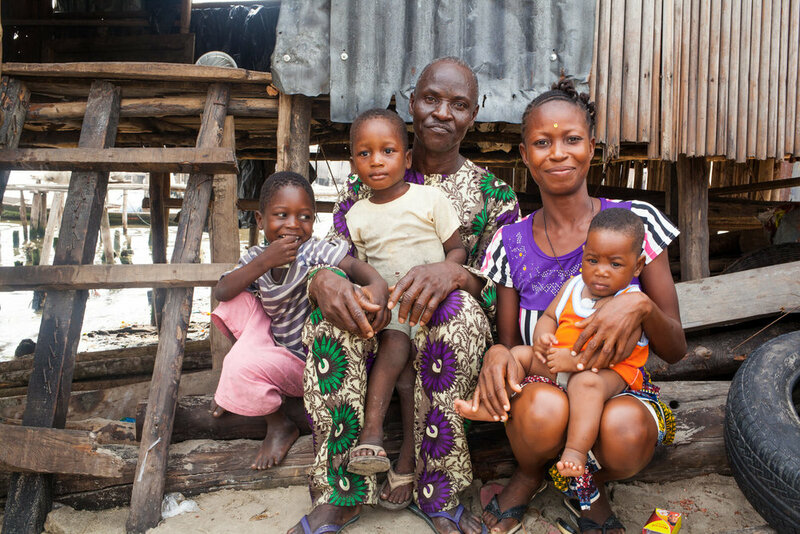 He moved to Sogunro to rent a room for himself, his wife and three children. He was able to save two or three sewing machines for his wife who is a tailor. Alice Kiki was forced to move to Sogunro following the evictions in Otodo Gbame. Gerard Avlessi is a community leader in Sogunro. He is also a member of the Nigerian Slum / Informal Settlement Federation, and has been involved in Federation activities for the last few years. He and a few others have been leading the outreach to other Egun communities in Cotonou, Benin. Gerard owns and runs a tailoring school in Sogunro. Gerard teaches tailoring to a number of young apprentices. 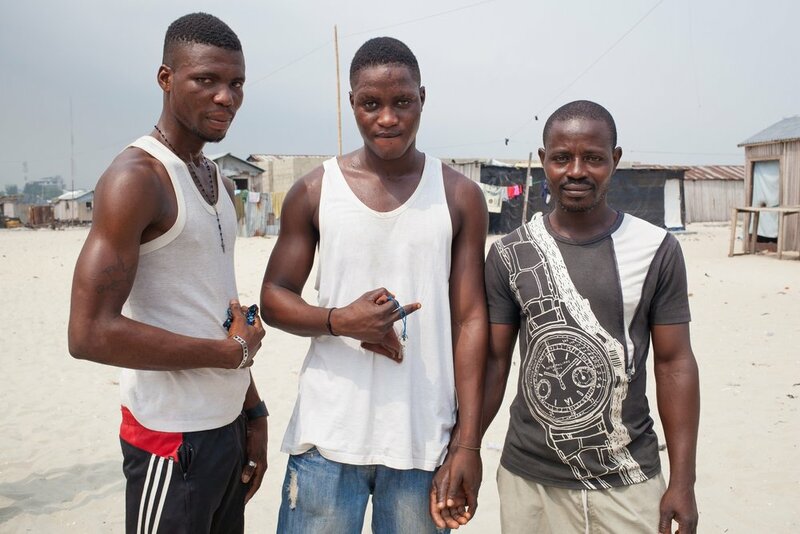 Some of the apprentices are also members of the Nigerian Slum / Informal Settlement Federation. One of the many tasks being undertaken by the Federation is to profile the communities. Community profiling, mapping and enumerations gather data that can be used to identify our needs and urban planning solutions. This fisherman is from the community, and lives close to Gerard. 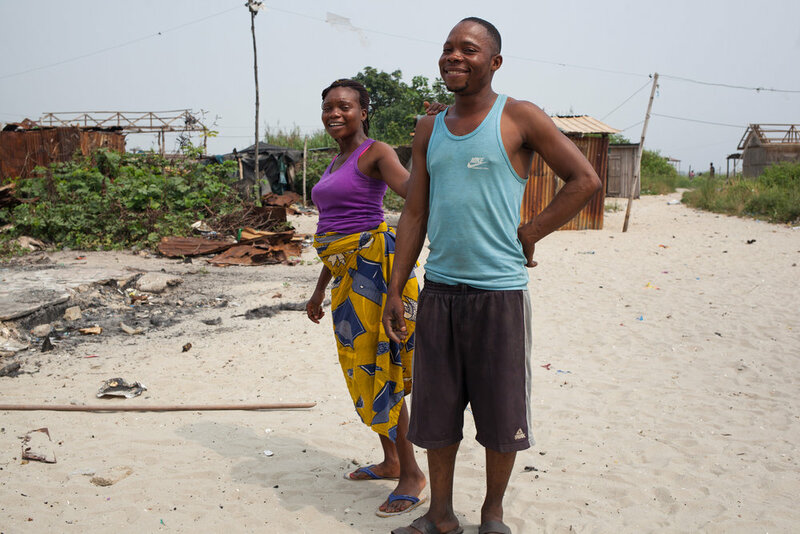 He invited his sister, who had lived in Otodo Gbame during the evictions, to come and stay with him when her house was demolished. Victoria Amsu is a tailor from Otodo Gbame. After the evictions she moved to Sogunro. Her house was burnt and wasn’t allowed to go back to pick anything up before her house was set ablaze. Many evictees have begun to return, though the rising cost of land on the waterfronts of Lagos remain a continued threat for Sogunro as well as Otodo Gbame and many others. The Lagos government is intent on reinventing the city as modern and forward-looking, though the sprawling Makoko community is seen by those city planners as an 'embarrassment'. The future of all waterfront settlements in Lagos are faced with uncertainty. With security of tenure lacking, what can be done to ensure thousands more residents don't become refugees in their own city? 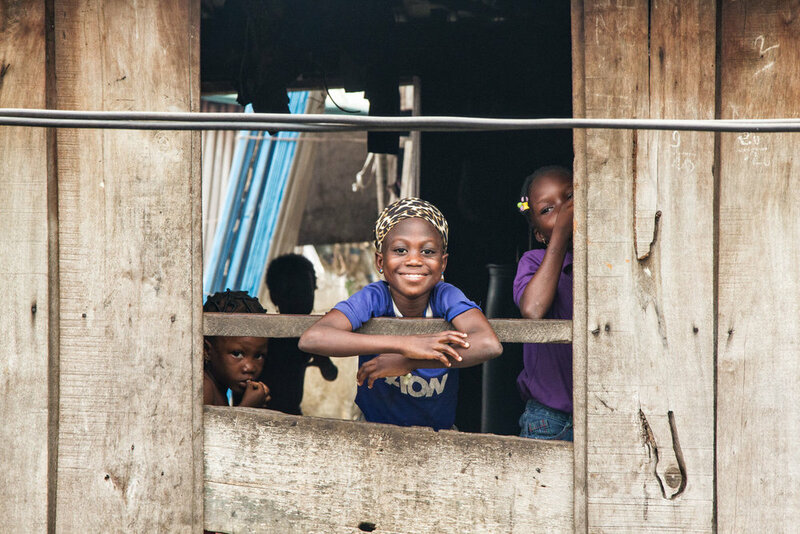 In Lagos and estimated two-thirds of the citiy’s 23 million inhabiltants ive in informal settlements, with a lack of security of tenure a defining characteristic. Without it residents live in constant fear of eviction. However, skyrocketing growth in Lagos has led to conflicts over land, often resulting in violent attacks on poor communities and a continued threat of mass evictions of the urban poor across the city. In November 2016 more than 30,000 people lost their homes when they were forcibly evicted from their community of Otodo Gbame. Eyewitnesses told how ‘area boys’ (local hoodlum) armed with machetes were sent into the community to douse the buildings in petrol before setting them ablaze. The police then entered, shooting at residents and forcing them to flee to the water where many drowned. Finally, bulldozers were used to demolish homes, schools, churches and other community buildings. Many residents believe that the powerful Elogushi family who claim ownership over a tract of land that includes Otodo Gbame were behind the evictions. In January 2017 a Lagos State High Court judge ruled that the waterfront evictions were cruel, inhumane and degrading. Residents have begun returning and commencing the rebuilding process following the destruction. Evictions and the resultant loss of homes leave residents as refugees in their own city. 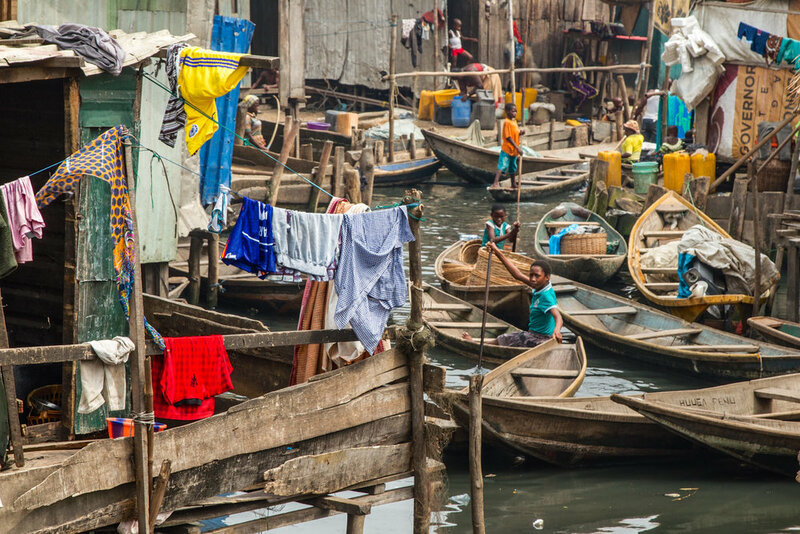 Following the evictions in Otodo Gbame, residents from Sogunro, another waterfront informal settlement, travelled through the lagoons of Lagos in boats to collect and accommodate evictees in their own homes. 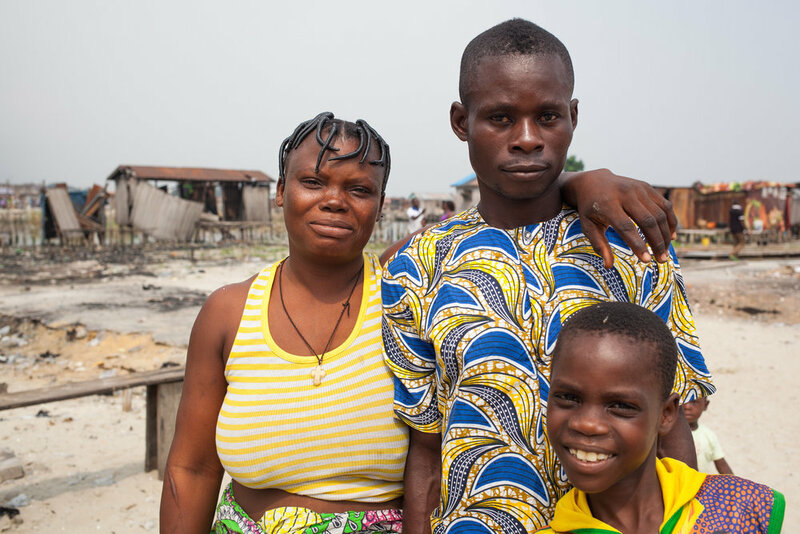 Residents from Otodo Gbame have suffered greatly, and in many cases have become separated from family. Meanwhile, the already densely populated host-community of Sogunro has been strained by the sudden growth in population. Overcrowding has led to illness and disease outbreaks, though there is no government health centre within the maze of waterfront buildings. 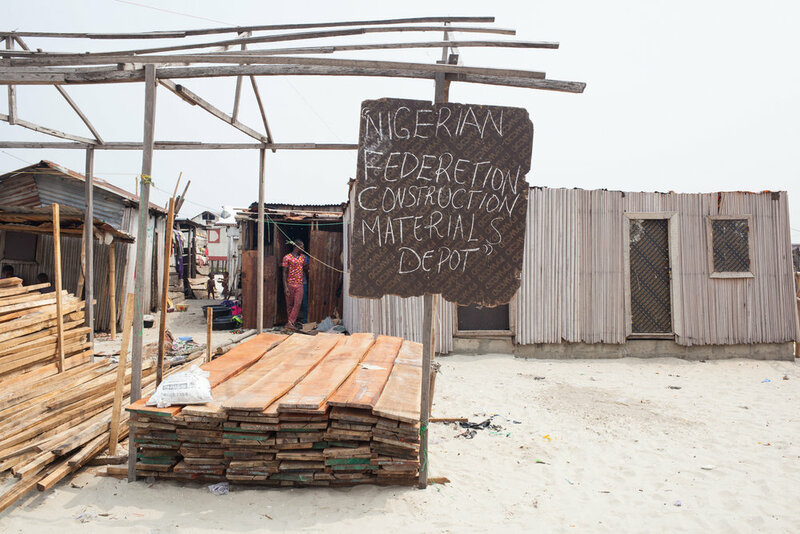 Some residents are slowly starting the process of moving back and rebuilding Otodo Gbame, though the threat of evictions remain for all waterfront communities in Lagos, including Sogunro. These photographs portray the communities of Otodo Gbame and Sogunro, and tell the stories of the hosts and evictees who have become refugees in their own city.